The term basslet is used in the aquarium hobby to indicate members of several different families including Grammatidae, Serranidae and occasionally some of the smaller members of Plesiopidae. Basslets are a commonly kept group of fishes due to their small size, bright colors and interesting patterns. 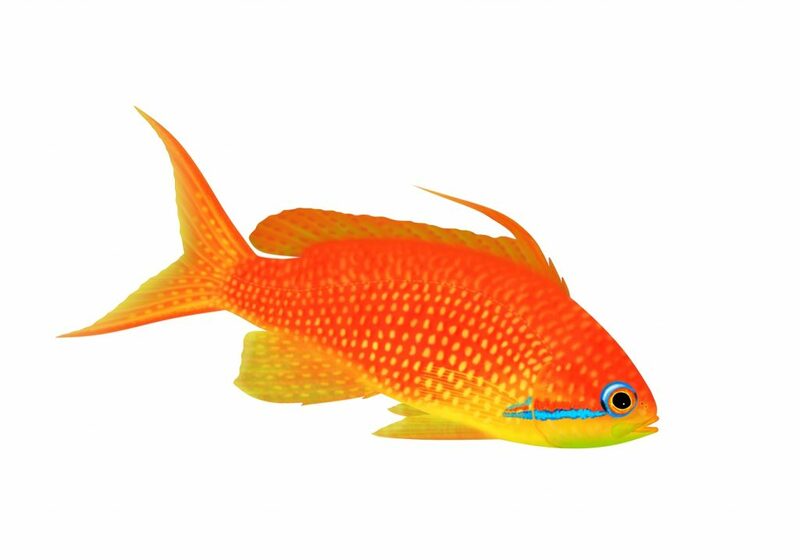 The Royal Gramma (Gramma loretto) is one of the most commonly sold basslet species. Some other commonly sold basslet species include the Swissguard Basslet (Liopropoma rubre), Blackcap Basslet (Gramma melacara) and Yellow Assessor (Assessor flavissimus). Representatives of the basslets are found in tropical and subtropical oceans all over the world. They can range in size from 2” (5 cm) to 5” (10 cm), though most tend towards the smaller size of this range. Most basslets are cave dwelling fishes and tend to be found at greater depths. Some of the basslets available in the aquarium industry come from such depths that are actually collected by a specially designed submersible. It takes several days for these fish to be properly decompressed before being brought to the surface! Basslets can make great aquarium inhabitants, provided their husbandry needs such as diet, water quality and tank space are met. Basslets prefer a temperature range of 72F (22C) to 80F (26C). Basslets are generally considered reef safe as they will not harm corals or most ornamental invertebrates. It is important to consider carefully what species of basslet may be best for your aquarium. While some species such as the Chalk Bass (Serranus tortugarum) are suited to brightly lit reef tanks, other more sensitive deep-water species such as the Candy Basslet (Liopropoma carmabi) may be better suited to a more dimly lit tank.